Hey guys I just created a tiny sample app demonstrating tvOS 10 new APIs. I open-sourced it because the AVContentProposal API is still buggy and I wanted feedbacks from other developers from the world. The same app won't crash on the device, but user will left with weird screen like this. 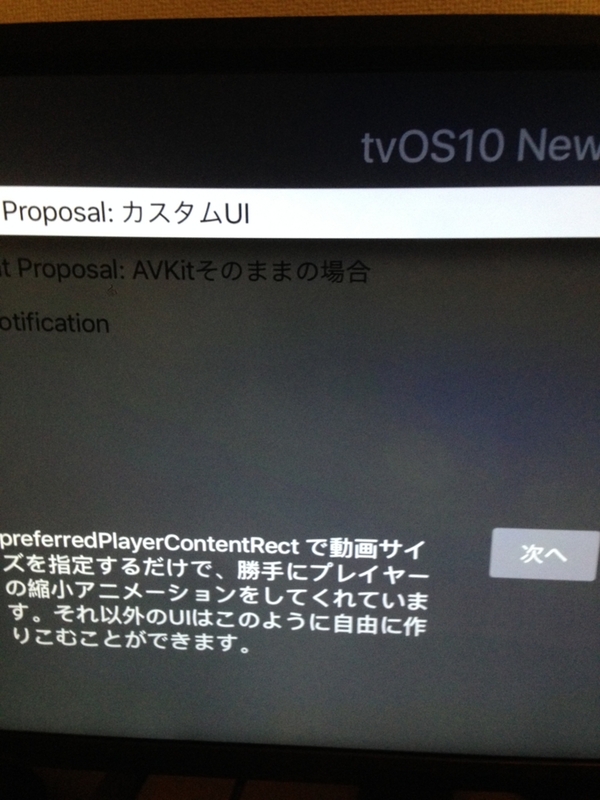 Sorry my AppleTV is in Japanese, but you can see the ContentProposalViewController in front of the first view. 2016-09-24 19:01:29.520 TVOSTest[87178:254281] Presenting view controllers on detached view controllers is discouraged <TVOSTest.ViewController: 0x7fb02c026e00>. So it's depends on you whether you should use AVContentProposal or not. I will update if I found any workarounds.